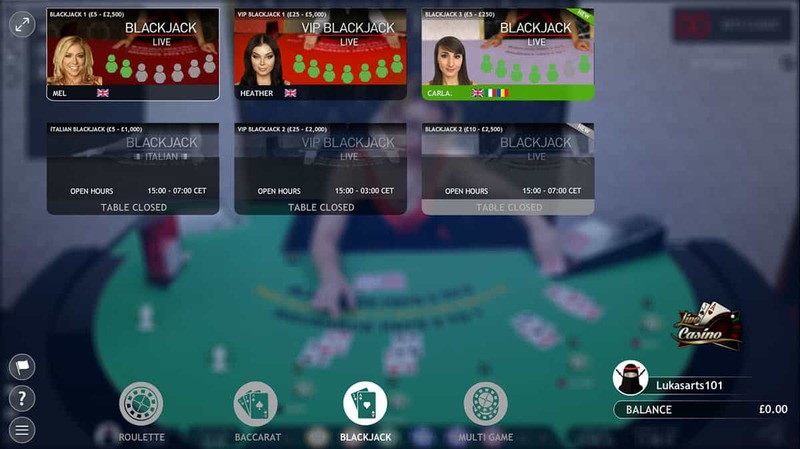 London-based Live Casino outfit Extreme Live Gaming sets out to deliver superbly playable Live Casino games, and surely the jewel in the crown has to be its Live Blackjack offering? We can easily switch between other Blackjack tables, but with three tables readily accessible both day and night Extreme Live Gaming enures it’s operating a 24 hour Blackjack party. Live Blackjack needs to be smooth. Extreme Live Gaming’s Live Blackjack games are precisely that, with the camera positioned slightly above the dealer’s eye level so he or she has to look slightly up at us. No doubt it’s a tactic to make us feel more at ease, and it works. The tables are well lit and curved in traditional style, with varying felt colours between each table. A satisfying eruption of chips springs up from the bottom of our screens when we score a winning hand. Score a Blackjack and a shimmering Blackjack sign spins with glee and we earn the game’s top jackpot to boot. Blackjack payouts run along classic lines with a top payout of 3:2. Insurance wins pay out 2:1, while standard wins earn us 1:1 payouts. The speed of game-play depends on how many players sit at the table (there are seven seats per table) and how quickly they make their bets, though Extreme Live Gaming uses high quality technology and skillful dealers to ensure that game-play speeds are as quick as they can be. If our connection speed is struggling we can toggle the video quality via the options to the top left of the screen, and we can also toggle audio settings if we so wish. Split aces deals a single extra card per ace, with split aces and 10s counting as 21 rather than Blackjack. It’s small wonder that Extreme Live Gaming’s Live Casino offering has earned the London-based casino provider plaudits from providers and gamers alike. Unique styling, decent game variety and excellent delivery make these Live Blackjack tables round-the-clock must-plays. The Extreme Live Gaming VIP Live Blackjack tables give higher-rolling players the chance to throw down some hands, with betting ranges of between 25.00 - 5,000 and red felt rather than green. All are accessible via the game lobby, opened when we click the relevant tab in the options to the bottom left of our screens.